In Christie's exclusive online charity auction, the unique Omega Seamaster Aqua Terra special watch was sold to 106,000 Swiss francs . Since 1995 GoldenEye of 007 movies, the Omega Seamaster James Bond watches are effective equipment. When Omega designers as "007 Goldfinger" movie fiftieth anniversary design gifts, "gold watch" will undoubtedly become the best choice. 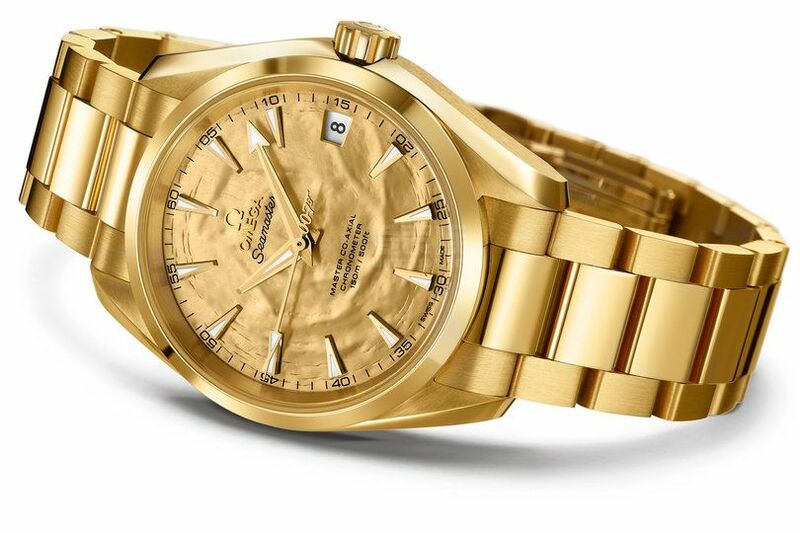 To pay tribute to the 007 popular film series, Omega has created this unique Aqua Terra 18K gold watch. On September 17, in the online charity auction to celebrate the 50th anniversary of the "007 Goldfinger", While this special timepiece to 106,000 Swiss francs (70,000 pounds) to shoot. Bidder's valuation of the transaction price watches almost eight times! So compelling transaction price makes Omega Seamaster Aqua Terra watches become the most successful online auction auction items,which is also the most difference between the transaction price and the valuation disparity auction goods. next articles: 2014 Breitling Colt SuperQuartz Watches introduce.